The following “project webpage” was developed in response to the Transportation Improvements Generating Economic Recovery (TIGER) 2017 grant solicitation. The City of Arvada completed the application process with the support of the Arvada community, Jefferson County, and the Colorado State Department of Transportation. Unfortunately, the project was not selected for funding by the Federal Highway Administration. The City of Arvada thanks the community and partners that provided support throughout the process. The project is a priority for the City and will be submitted for future grant opportunities. The City of Arvada in partnership with the Colorado Department of Transportation (CDOT) is in the process of applying for a grant program known as Transportation Improvements Generating Economic Recovery (TIGER). The purpose of the grant is to provide one-time discretionary funds to transportation projects that benefit the national, regional, and local economy. 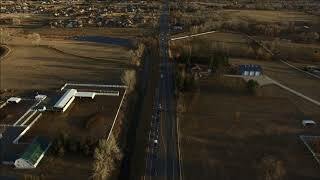 The City of Arvada is excited to participate in this collaborative opportunity and is applying for a $20,000,000.00 project to widen the State Highway 72 (Indiana St) between W. 80th Ave. and W. 86th Pkwy. The project involves reconstruction of a Union Pacific Railroad (UPRR) bridge that then allows widening of SH-72 (Indiana St.) from a narrow 2-lane highway to a 4-lane median separated roadway with bike lanes and sidepath trails. The project is intended to reconstruct an antiquated railroad bridge and address congestion on SH-72 (Indiana Street) from W. 80th Ave. to W. 86th Pkwy. by adding travel lanes (capacity). While reconstructing the roadway, the project will also add bicycle lanes for cyclists and trails for pedestrians and novice cyclists traveling along the corridor. The SH-72 (Indiana St.) at UPRR Multimodal Widening Project is intended to benefit the freight rail transportation system as well as the regional highway and local street network. By reconstructing an antiquated railroad bridge, the project keeps over 20 freight rail trips on-track and ensures reliability of goods and raw materials that impact our nation’s economy. The reconstruction of the bridge provides an opportunity to widen the bridge span, which would then allow widening of the SH-72 (Indiana St.) from a narrow 2-lane road with small shoulder areas to the planned 4-lane highway with bike lanes, landscaping, and sidepaths. The 4-lane median separated roadway will accommodate the existing traffic volume (23,000 Average Daily Trips) as well as anticipated future growth and development. By keeping regional traffic on regional roadways, Jefferson County and Arvada resident concerns about cut-through traffic through Local Streets will also be addressed. The project will also widen the SH-72 (Indiana St.) intersections at W. 80th Ave. and W. 86th Pkwy., which will reduce congestion and delays on the City streets. Although the current congestion affects emergency response and operational safety, the efficient movement of people and goods on the regional transportation networks is ultimately in the best interest of our businesses, residents, and visitors. Indiana Street (SH-72) Widening, including local efforts to eliminate bottlenecks at signalized intersections as well as development projects that can contribute right-of- way and infrastructure improvements.